Gingerbread is a holiday staple around my house. 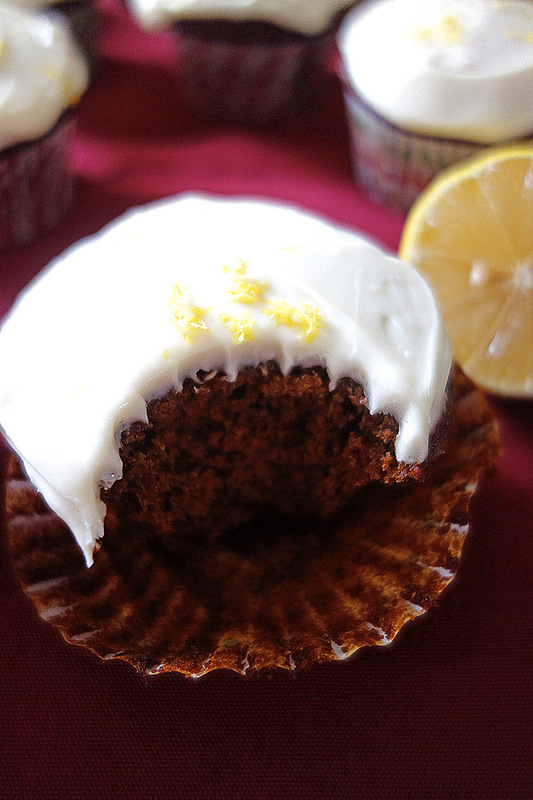 Aside from gingerbread cookies, my sister and I always make these gingerbread cupcakes with lemon cream cheese frosting. The tartness of the lemon mixes perfectly with the sweetness of the cream cheese frosting and adds a little excitement to these gingerbread cupcakes. These cupcakes come together pretty quickly. Begin with mixing your flour and spices. I love the smell of all of these spices filling my kitchen. It smells like Christmas to me. In a separate bowl, cream the butter and sugar with an electric mixer, then mix in the molasses and egg. Mix the two mixtures together to complete your gingerbread batter. Mmm. 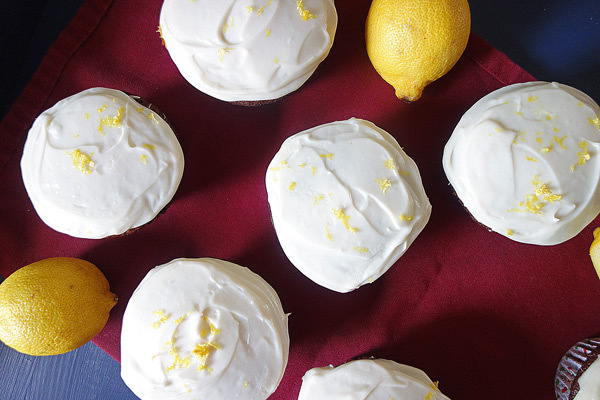 While the cupcakes bake, you can whip up the lemon cream cheese frosting. The cupcakes will need to cool a little before you frost them, but that way you already have the frosting ready to go. I typically don’t even measure the lemon juice. I usually use about 1/2 of a small lemon. You can add a little more or less lemon juice depending on how much lemon flavor you want in your frosting. 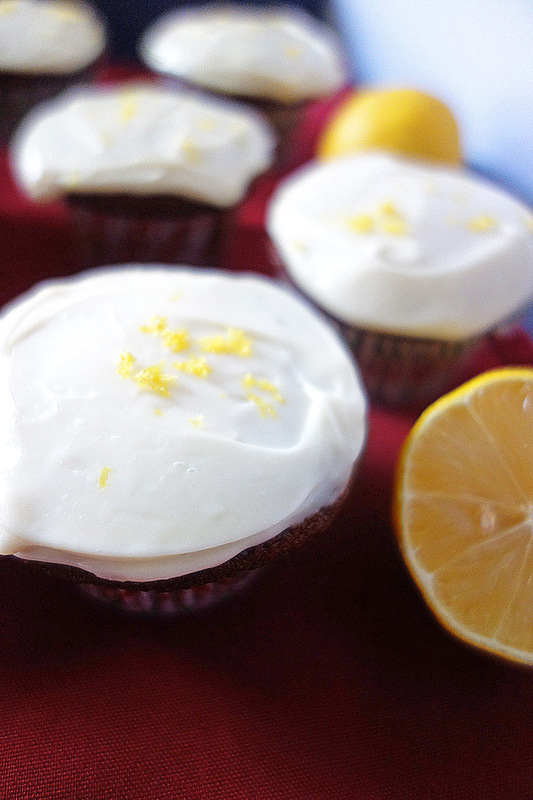 After you frost the cupcakes, you can top it off with the zest of a lemon, but it isn’t a necessity. These taste great even without that little addition! 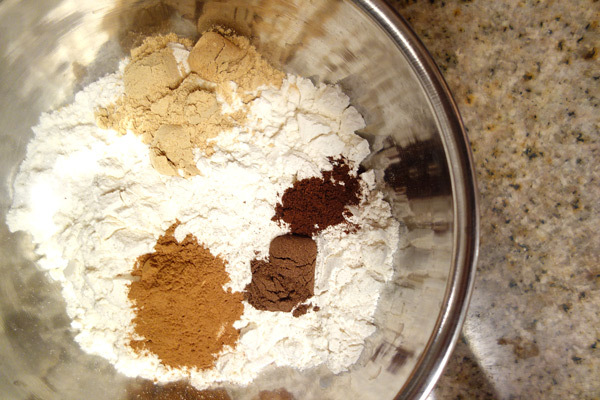 Mix together flour, ground ginger, cinnamon, cloves, allspice, and salt. In a small saucepan boil 1/2 cup of water and stir in baking soda until dissolved. You can also boil the water in a glass measuring cup in the microwave and stir in the baking soda after removing the water from the microwave. Stir the water and baking soda mixture into the butter and sugar mixture. Stir butter and sugar mixture into flour/spices. Line 12 muffin tins and spoon in batter, filling around 3/4 full. Bake in a 350 degree oven for around 20 minutes. While cupcakes box, mix cream cheese and powdered sugar until smooth. Add in vanilla and lemon juice and mix again until incorporated. Once cupcakes cool, frost with lemon cream cheese frosting.